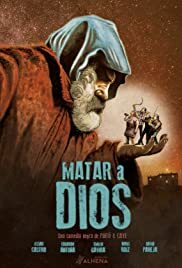 Director: Caye Casas, Albert PintóWriters: Caye Casas, Albert PintóStars: Eduardo Antuña, Itziar Castro, Emilio GaviraSummary: An extended family is spending a holiday together in a remote location when a mysterious dwarf visits them and informs them that he is god. Then he tells them that all humans are going to die the next morning, with the exception of only two survivors. And that the family must choose which two people will live.